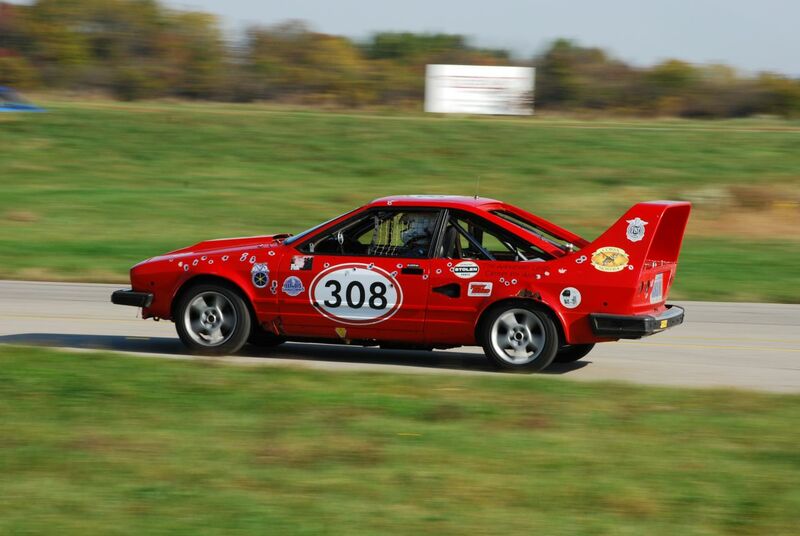 It’s April in Michigan, which means that it’s time yet again for 24 Hours of LeMons faithful to spend a weekend at Gingerman Raceway freezing their collective butts off racing their rust-speckled hoopties, most of which have survived a few decades of tough Midwestern winters. It looks like racers may avoid the always-possible blizzards of past “Cure for Gingervitis” races, but no matter the temperature, the Tunguska-strength winds off Lake Michigan manage to make it feel considerably colder. Nevertheless, something like 75 teams of fools stoic Midwesterners have arrived to fight mechanical gremlins and finger-numbing night-wrenching sessions. Here are a few of the cars we saw from Friday’s BS Inspection at LeMons Michigan. We have a number of storylines to follow this weekend, including several LeMons-grade heavyweight head-to-head races. Last summer saw the first pair of GM Dustbuster vans facing off with Morrows Racing’s supercharged Lumina APV “Racevan” cleaning up against the Bad Decisions Racing Pontiac Trans Sport. Of course, the Racevan had its woes during the practice day, most of which began and ended with a cracked engine block and a small oil fire that nuked the ancillaries on the supercharged 3.8-liter V6. Facing off against the being-repaired Monorail van is, yet again, Bad Decisions Racing. Their Pontiac Trans Sport sports the naturally aspirated version of the 3.8-liter V6 found in the Monorail van. After much struggling with the rough four-speed automatic, they also have adopted the five-speed manual transmission from a Chevy Cavalier. Following a stint as an Imperial shuttle from Star Wars Barber Motorsports Park, the Trans Sport now appears as the USS Enterprise from Star Trek, complete with a fluffy team Tribble. The van-on-van action is not even the only heads-up race for Bad Decisions Racing. In the same race that they lost to the APV, they also crushed the only Trans Am in the LeMons field in a Trans Sport vs. Trans Am duel that we coined the “F-U Showdown” (for the cars’ respective GM platform codes). That TruckNutz™-toting Trans Am, belonging to Dumar ES Racing, blew up its tired old 350 at that race. Naturally, the team looked for a small-block V8 replacement and the team “benefitted” from a ’71 Chevelle owner looking to offload the muscle car’s original 307 cubic-inch V8 so he could, of course, make an SS clone. This is LeMons’ first Chevy 307, an engine renowned for decades for its utter worthlessness. We’ll see how it fares against other small blocks, but its reputation as a horrid lump of a motor led this Trans Am to end up in C class where it will race heads up with the Trans Sport. Gingerman being the home state of the Big Three, we’d be remiss without a proper battle of American luxury cars and boy, have we got them in Team Sheen’s Dodge Mirada and Burnt Rubber Soul Racing’s Chrysler Imperial, both from the year that Ronald Reagan took office, 1981. Consider this a warm-up round to the Spec Land Yacht debut at Gingerman in October. Team Sheen’s Mirada has been around for a couple years and is a former IOE winner. They’ve also come close to winning Class C at least once, but the problematic old Chrysler LA engine was (one of) the car’s Achilles Heel(s). After a month or two of nonstop thrashing, the team have ditched the old carbureted 318 for a late-model 5.9-liter Magnum V8 swap from a 1990’s Dodge Ram. Will it solve all of their problems? Probably not, but it can’t be a lot worse than the oil-dumping 318. The Imperial, meanwhile, sports a muscly Mopar Lime Light-ish finish and looks clean enough to eat from. This is a properly auspicious 1980s personal luxury coupe. Under the hood sits a carb’d 318 cubic-inch V8, ready to churn out literally dozens of horsepower. The underhood numbers of a compression test caused a bit of Supreme Court cringing, but the small-block Chrysler is nothing if not tough. Most importantly, the Imperial had a wing-mounted tachometer so the many passing teams can see the 318’s struggles in real time. If that’s not enough excitement for you, we’ve also got this beat-to-hell 1993 Buick Park Avenue Ultra from Rot Rocket Racing, painted up like a low-rent General Mayhem. Under the hood sits the same 3.8-liter V6 in both race vans with an Eaton supercharger attached to it. Just like a Hellcat, pretty much. The team paid $200 for the Buick from its geriatric owner, who had put 250,000 miles on the old gal. This rusty old Detroit hooptie will also race in Class C with the Mopars, Dustbuster vans, and 307-powered Trans Am. Unsurprisingly in Michigan just a little less than half the field (35 of 78) come from American brands, which seems like it must be a record though we’re too lazy to check. Also in Class C? You guessed, it the 1961 Rambler Classic that is traveling the country this year. LeMons Supreme Court Justice Steve McDaniel drove it up from Dallas after the challenging conditions of its last race, though the 2.3-liter Ford Lima engine runs reasonably well now, we’re told. Pennsylvania team Silent But Deadly have signed on to mind the Rambler’s reins. Judge Phil (aka Murilee Martin) also bought the Rambler an Iggy Pop action figure, which will travel the country strapped to the rollcage of the Ramble It Forward car. Speaking of Iggy Pop, Judge Phil’s commemorative bribe stencil celebrates the twiglike Michigan native and punk rock icon. We’ve seen a lot of obscure movie and TV cars in LeMons, but the “Doobby’s Taxiola” Dodge Neon completely stumped the LeMons Supreme Court until the team broke out the relevant scene from Planes, Trains, and Automobiles on a tablet. After a refresher from the decades that have passed since any of us have seen the movie, we realized that this was, simply put, one of the greatest and most obscure LeMons pop culture references of all time. This old Alfa Romeo GTV6 won at Gingerman way back in 2010 but was sold off to another team to race for a few years in another series. The original owners got their hands back on it and essentially rebuilt it from scratch, topping it off with custom bodywork and paint to make a credible Alfa 155 DTM car replica. The front splitter is from a Mustang Cobra, the hood is from a Dodge truck, the decklid is from modular shelving, and somehow, the damn thing just looks gorgeous. On the opposite end of the spectrum, we’ve seen a lot of homely Mazda Miatas, but this one might take the ugly cake. The team is the aptly named Hatchback of Notre Dame and they inexpicably grafted a Geo Metro hatch onto their Miata, adding some cut-up trash compactor steel to make the sides. The result is unparalleled Miata sadness. We love it. Pay attention new teams: This is how to run a Miata. So who will win it all? More importantly, who will win in these fantastic races within the big race? Follow the race on live timing and on the 24 Hours of LeMons’ Facebook page. You can also see live footage this weekend from the Race Rambler and the Rough Knuckle Racing Miata on Racecast.me. Be sure to keep the entry list handy and then check back here on Roadkill to find out!